Slab of white marble, broken on the right side and the bottom (46 x 25 cm). Findspot unknown. For the building in which a group of cowherds met, see B6 in AGRW and photo further below. The "L. Aninius Fla. . ." in line 13 may be the L. Aninius Flaccus who is attested as a hymn-singer (see IPergamon 374 A, line 11). 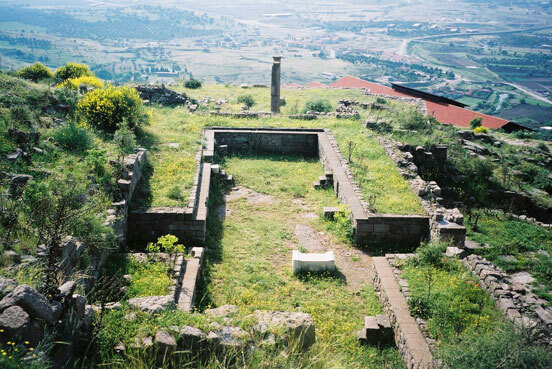 C. Julius Diokles in line 20 may be identified with the civic commander (strategos) in IPergamon 361 and 362. To good fortune! On the occasion of the triennial festival, the dancing cowherds honoured Gaius Antius Aulus Julius Quadratus, twice consul, proconsul of Asia, and priest of noble ancestry … of Dionysos Kathegemon (“Dionysos the Leader”) (?). Auphidia Polla daughter of Publius; Claudius Quadratus, (10) the assigner of offices; Gaius Silius Maximinus (?) … the chief–cowherd (archiboukolos); Lucius Aninius Flaccus (?) … The cowherds: Claudius Epaphos who is also called Name …, Flavius (?) Julius Diokles, Menandros son of Menandros …, Kapiton son of Menophantes, Titus Flavius Athenodoros (?) … (20) Gaius Julius Bassos Claudianus (? ), Bion son of Bion, Hermaiskos …, Charmides son of Eikadios, Titus Claudius Lindos, Tiberius Flavius Secundus, Philetairos son of Philetairos, and Epineikos son of Epineikos. 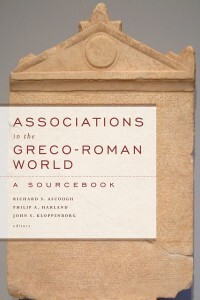 Facsimile by Conze and Schuchhardt. Cowherds’ Hall of Benches (Podiensaal) at Pergamon. © Philip A. Harland 2012.